Just Games is pleased to announce that we have been selected as an official venue for the 2017 Guild Ball Regional Qualifier circuit, a new international championship series presented by Steamforged. Are you ready to take to the pitch and prove your skill and determination is higher than that of anybody else in your local area? Could you go all the way to becoming National Champion, and maybe even the World? A Regional is a special Guild Ball event, hosted by Steamforged at various conventions around the world. Excellent stores in each region with strong Pundits and communities are selected to host qualifiers. 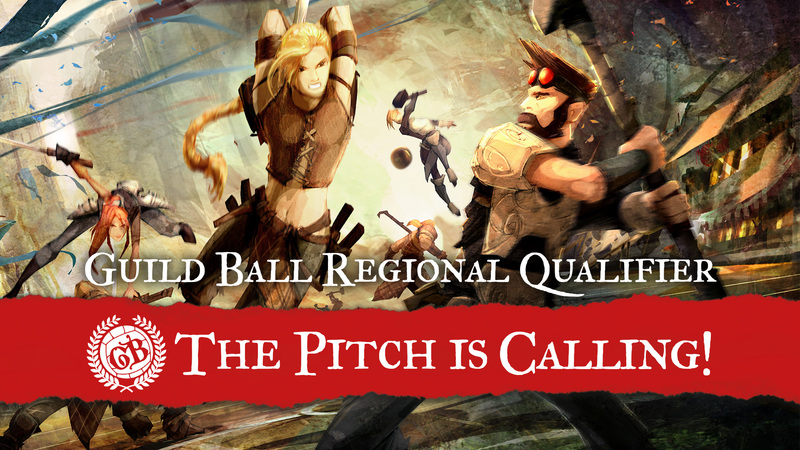 These Regional Qualifiers, or “RQs,” are the highest level of in-store play available for Guild Ball. Our Regional Qualifier qualifies players for the Regional Championship which is held at the Southern Ontario Open. April 1, registration at noon. Player meeting, rules review, and overview of schedule at 12:30. Dice at 12:45. Doors open shortly before noon for this event, so pre-registration online is strongly encouraged. We are located at the West end of Panorama plaza, between Game Stop and Sears. 9 man rosters, up to 1 union, 1-2 captains and mascots. Straight Swiss per Regional Cup rules. Chess Clocks should be set to 45 minutes per Player. Admin/Clocked Out time is 10 minutes total with clocked-out Players being allowed 1 minute activation. Round Length is 100 minutes total. Details on format can be found on Steamforged’s official website. 1: Nobody’s Fool Painting Contest. Paint your choice of Guild Ball mini in “jester” colors. Painting will be judged by one of our local Pundits who is not participating in the contest. Winner receives a set of brushes. Entries due before the end of Round 2. 2: Pundit’s Choice. Our local Pundit’s are cooking up a special side event starting around Round 3 or 4! $20 per player. Register online in our pre-registration page. Prizes will be directly proportional to the entry fee, details will be announced here shortly (word is there are Steamforged prize kits we can purchase to accommodate our expected number of players). First 20 players to pre-register will recieve a Just Games Guild Ball Measuring tool commemorating this event. If you’re traveling to the area, and want to stay the night, you can find multiple hotels within 5 minutes or less of our store by car, with options within walking distance. Check out the Country Inn and Suites (call 585-784-8400) or Comfort Inn (call 585-273-8410) in Penfield NY if you want a “budget” option (Penfield isn’t exactly cheap), or the Courtyard Marriott (call 585-385-1000) if you just want to be close by. The plaza has ample parking for around 40 cars directly in front of us, and another 200 spaces within sight of the store front. Food can be found at the Tops grocery next to us, restaurant “George’s” on our other side, or at the far end of the plaza which boasts a Bill Greys, The Pour House, Burger King, and some other breakfast places. Drinks are available on site (please, no outside drinks), and several other venues will deliver food should you prefer that method. Did we mention pre-registration is encouraged? Seriously, we are not the world’s largest game store, but we want to accommodate everyone who might want to play. We can do 30 players without batting an eye, and up to 50 with some advanced warning. More than that we need to coordinate with other local venues, and advanced notice would be seriously helpful. So help us help you! Pre-register online. Remember, the first 20 people get a Just Games measuring tool to commemorate their visit!